When workday is done and dinner is cleared there's time for you. Providing a spot to relax and unwind with your favorite book, magazine or music is what we offer here with our Amish Skyline Panel Chair Recliner with Optional Motorized Recliner Chair. If the cat is not already in it, this is the chair to keep you comfortable each day watching your favorite program or returning phone calls. 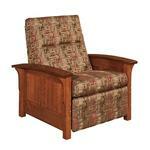 With rich side panels and roomy armrests, this piece of American home furniture will soothe and satisfy! We are thrilled to offer a customizing option that allows you to include Optional Power Recline! Snuggle up with that blanket and recline with our motorized reclining mechanism that sets your seat at the angle you desire! You man the remote and the touch of a button allows you to lean back for that much-needed nap! Only one power socket is needed for this device! This chair can be further customized with a motorized reclining mechanism that will set the seat at your perfect level of recline at the touch of a button on the convenient wired control remote that comes standard with all motorized chairs.